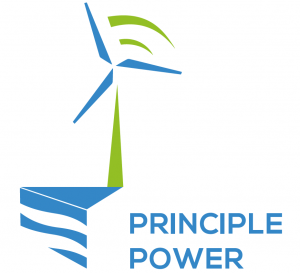 Principle Power is an innovative technology and services provider for the offshore wind energy market. PPI’s proven, patented technology, the WindFloat – a semi-submersible floating wind turbine foundation – provides access to transitional (40-60 metres) and deep-water (over 60 metres) sites, globally – by offering an enabling technology for the development of the OFW industry as whole and opening new deep water markets. The WindFloat technology is an efficient, semi-submersible platform that comprises three stabilising columns with water entrapment plates, and a system to control flow of ballast fluid between internal volumes. The system is designed to work with any commercial offshore wind turbine which is mounted on one of the three columns to minimize material requirements and reduce structural complexity. Due to its shallow draft and inherent stability, the WF allows installation of the wind turbine at port and can be towed to site using standard tugs, eliminating the need for offshore construction with expensive jack-up crane vessels, reducing cost and risk and bringing a major paradigm shift to the industry. The technology has been fully proven through our full-scale prototype (2MW Vestas V80 turbine) located 5km offshore Portugal. In its five years of operation, the prototype has delivered over 17.5GWh of electricity to the grid and survived waves of up to 17m without sustaining any structural damage. PPI is now in the path towards commercialization with several projects around the world. The three most advanced projects include a 25MW project in Portugal by 2019, a 50MW project in Scotland by 2019, and a 24MW project in France to be operational by 2020. These projects are unlocking the development potential of commercial deployments ranging from 100 to 1,000MW (PPI is currently involved in ~9,000MW) in world markets from the US, Europe, to Japan, Taiwan, Korea and China. The WindFloat technology is launching a new industry with vast potential; global potential for floating wind is estimated at 6,500GW.